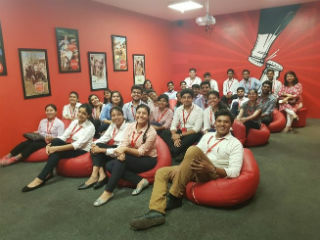 Jims PGDM-IB has organised an industrial Visit to Happiness Factory- Coca Cola(Moon Beverages Pvt. Ltd.), Greater Noida on 31st August, 2018. 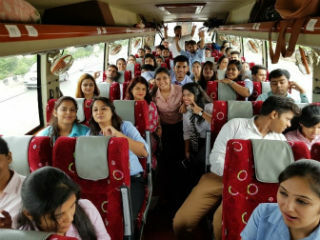 60 students from PGDM IB department went for the visit. The Visit Begun with the introduction of Happiness Factory Coca Cola by Saurabh Singh, Marketing Manager of Coca Cola. The happiness Factory is a concept developed by Coca-Cola themed museum along with the product lines. 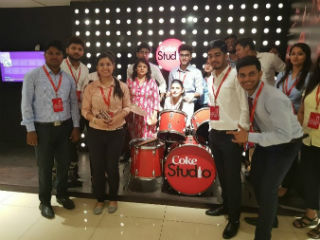 Students were shown entire operational process of Coca- Cola product range (Limca, Mazaa, Kinley Water, Minute Maid, Coca-Cola Zero, Fanta) in bottles and cans of various sizes. The students were informed that the factory produces 600 cold drink cans and 240 Mazaa and Minute-Maid bottles per minute. The visit showcased the growth of Coca-Cola and its product range since 1886. The other part of the visit highlighted various CSR activities undertaken by Coca-Cola. Students were thrilled by playing X-box games and listening to Coke Studio music. So it was a great learning experience for the students. 3, Institutional Area, Sector-5, Rohini (Near Rithala Metro Station), Delhi-110085.